Space is awesome. The whole emptyness of it all. It is so big and empty and awesome. You know, I really like Elite Dangerous. 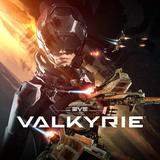 It is more of a space simulation than this game, Eve Valkyrie, which is more of an arcade game. You strap in, get shot out of a cannon into space where you kill as many other spaceships as possible. If you die you loose a point and respawn. Simple. This game was made primarily as a multiplayer death match game. You shoot down other space crafts in this space game. Then they added a single player option. The campaign is a couple of disconnected missions with accidental lore. Shoot some AI opponents and find relics and audio recordings. It soon gets very repetitive, and cruising an asteroid field looking for blips seems enjoyable at start but it's a drag after just a few hours. Then VR. VR is probably the only reason why this game exists. VR brings a sense of space to any gaming experience. And when you get a sense of space in space, it becomes quite sensational. I just wish I had this sensation within another game, within Elite Dangerous. Because Eve Valkyrie is a mess of a game. It doesn’t know what it wants to be, a multiplayer game, an AI dogfight game, an exploration game or a narrative game. So it does everything badly. The multiplayer doesn’t match me with other players, the dogfight has no depth we just keep circling each other, the exploration is not interesting enough and the narrative is a mess, I can’t follow anything of it. So this is a bad game, but if you want to experience the space in VR I recommend you download the demo. It’s quite cool, but beware that it's also very easy to get motion sickness when there is no up or down, just space.